I love a fresh start and a change in pace. The New Year is the perfect time to start new projects, and there are a few that I am participating in. 1. First is a sock knit-along. I am knitting with Amanda, Kayanna, Amy, and Amanda! They are all knitting pros, I'm definitely the beginner in the bunch. I am using Madeline Tosh sock yarn in oxblood. It is the richest color, and I love using it so far. This is my first time using DPN's (double pointed needles), and they are a little scary. But so far so good! 2. I am doing two photo projects: January Photo a Day and the 365 Project. 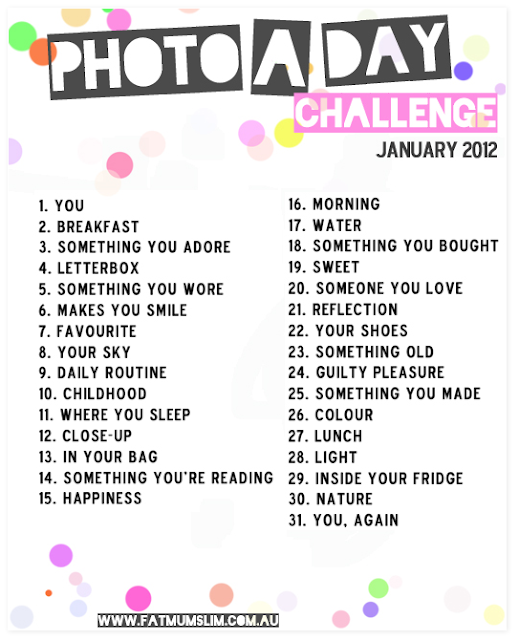 The January Photo a day is a list of specific pictures that you take every day during this month. This the list, it comes from this blog, and you can read more info there. I am posting my pictures on Instagram (@fussycut) and Flickr. As for the 365 Project, this is one photo a day for the entire year. I've always loved seeing others do this, but it seemed like a lot of work. 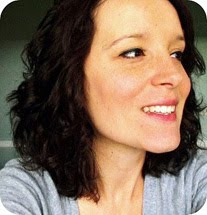 Karyn mentioned the 365project app for iphones/ipads, and it is so easy! I take so many pictures daily on my ipad, so this will be a fun and simple way to organize. 3. I am hoping to join the rose star block party. I really enjoy paper piecing, and I am hoping to make this for my table or wall. The block party is being hosted by Clare, isn't her quilt gorgeous? 4. We wll be starting the Farmer's Wife quilt-along back up in February, and I am looking forward to getting back to these little blocks. For now, my pretty stack of FW fabrics will be waiting for me in my sewing cabinet. If you are thinking about making the FW sampler quilt, this would be a great time to start! Lots of people are starting now that that it is a new year. What about you? Do you have any fun new projects you are starting/participating in? Ooh thanks for the mention. I'm very happy you have joined up!! I have been making socks for a couple of years now. I started with double points but have switched to a circular. I find it so much easier and less intimidating to use the circular. So many less lost stitches and gaps in my work too. Thank you for reminding me that I wanted to do the 365 photo a day project this year. I to will be doing a Farmers Wife sampler quilt this year. I figure if I can do 2 blocks per week and then every other month do an extra block, it will take me all year to finish the quilt. I've already got my first two blocks done. Love your blog. Your sock is coming along so good already - your ribbing looks perfect:) Love the colour you picked too! I am so ready to get back to making my FW blocks. They were on hiatus while I got some quilt tops done. Wow, you have a lot going on! I'm going to get started on a modern double-wedding ring quilt (king sized!) for my parents' 40th anniversary in August, and I'm going to join Heather in the Civil War Diary Quilt-Along. Your sock-in-progress looks fantastic. Socks are the main reason I want to learn how to knit this year! All of your projects look like to much fun, especially the sock knitting! I've never knit socks and I'd love to give it a try! Let's see, I'll be jumping back on the FWQAL wagon soon (I let it slide when a bunch of other projects got in my way), I'll be joinging in on the Civil War Diary QAL (yes, I definitely think I need two sampler quilts), and other than that nothing really specific other than working on some of my own personal projects! You are certainly ambitious! Let us know how the socks go for you. I am tempted to get back into trying to knit socks, but the heal gets me every time. Maybe I will take the knitting class at the quilt shop! I call you soon for sewing. i always drool over the madelinetosh oxblood yarn!!! Good luck with the socks! I was intimidated by DPNs when I first tried them years ago but you couldn't pry them away from me now. I find the bamboo ones are the best and prefer knitting with four instead of five, but all knitters find their own favourites. I love the colour! Seems like 2012 is the year of the sock as there's so many sock KALs going on. I used dpns for the first time last month. It took a little getting used to but nowhere near as scary as I was expecting. Love reading about your projects and getting inspiration there. Keep it up!!! My spiritual gifting is cheerleading, so just let me know if you are getting bogged down and I'll pep you up!! You GO GIRL!! Glad to hear your plans for February and the FWQAL... I fell a bit behind. Catching up will be fun! I started a Photo A Day in 2006 and never regretted it! It's so worth it! I stopped these last couple of years but have made a New Years resolution to start up again! This time using my phone. I've set an alarm to go off everyday at the same time. And no matter where I am, or what I'm doing. I WILL take a picture! My photo a day project was the best journal I ever kept! Good Luck!!! Oh, and I got my mom a tiny circular for some fingerless gloves for Xmas because the DPs made her nuts! millions of projects. try to finish one old for every new. the socks are going to be amazing! and looks like the fun projects you're starting will be really fun to look back on. are you getting your madelinetosh locally or online? yes, that is a beautiful rose star quilt from Clare! i see it would be a nice relative for your swoon quilt. i am gonna do my first block party... thank you! you're always an inspiration, angela. i'll be happy to follow how your 365 comes along during the year. it's such a satisfying project! How is the sock coming along? I get myself mixed up with dpn's, I have to do magic loop for my socks. I am planning to start my Farmer's Wife soon. I got the book for Christmas, but haven't started figuring out hat fabrics I'd like to use. Looking forward to it! Your sock looks great so far! It's awesome that you're jumping right in! What an awesome idea to capture the year in a mosaic of photos ... am sooo inspired! Just love the rose star block ... am soo ready to join the party! Thanks for the encouragement to join the FW quilt a long - I've put it off thinking I missed the boat and now I am newly inspired!